Can you use a diffuser as a humidifier? That’s the question that crosses most people’s mind before choosing or buying an essential oil diffuser. So in order to answer that question, we have listed and compared the similarities and differences between a diffuser and a humidifier so as to give you a clear answer on whether you can use a diffuser as a humidifier. Both a humidifier and diffuser increase the moisture in the air. That is where the similarity ends. To understand how each operates, you need to learn more about their basic features. Diffusers are small devices that hold a small amount of water. The diffuser creates a small mist that emits an essential oil or essential oils into the air. An ultrasonic diffuser is a popular diffuser that vaporizes oils and waters using a plate that vibrates. Humidifiers are larger devices that hold approximately a gallon of water. The device controls the moisture in a space. You cannot mix essential oils and water in this type of device. This type of device can be hard to clean as water pools in the container. Do Diffusers Increase the Moisture in a Room? An essential oil diffuser, similar to a humidifier, will increase a room’s humidity. However, the extra moisture is not enough to be significant. The purpose of a diffuser is to dispense essential oil (EO) vapors into the air. The oils and water droplets are diffused together. To enjoy the benefits of additional moisture, you need to add a humidifier to your home. Can Essential Oils Be Used in a Cool Mist Type of Humidifier? 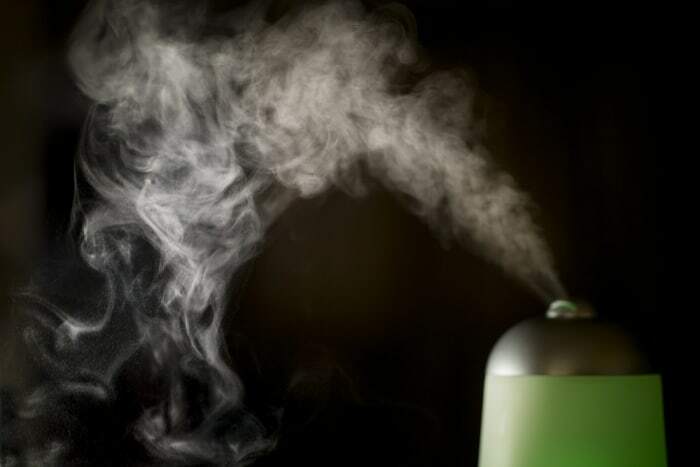 Essential oils should not be used in any type of humidifier for the following reasons. Reason 1: Essential oils are designed to be used in diffusers as humidifiers are not made to withstand the strength of this type of substance. If oils are added to humidifiers, they will often deteriorate rather quickly. Reason 2: Humidifiers that dispense a cool mist pull the water from a tank before emitting the vapor. A cool mist humidifier cannot mix the oils and water. You will not experience any benefits from the EO if you use this approach. Essential oil diffusers will moisturize a room but not to any significant degree. Diffusers and humidifiers that are combined for use feature a bigger well than other diffusers and emit a strong vapor that lasts several hours. You can find a number of these combinations for sale, including one that is called dewdrop, which is manufactured by a company called Young Living. It can be placed in a bedroom because of its quiet operation. If you purchase the starter kit, you can obtain the dewdrop at a wholesale price. Do not buy the product at retail because you will pay more. Once you find a humidifier and diffuser device that fits your needs, you can look over the various essential oil blends and recipes online. Take time to think about what essential oils are best for your condition or health needs. That way, you can make the most of using a diffuser. Remember that using a humidifier is usually something that you should do separately. By using a diffuser, your home will smell better and you will also breathe more easily. Essential oils make a diffuser unique from a humidifier. That is because essential oils have antifungal, antioxidant, and antiviral properties. These properties are released in the air though diffusion and assist people in feeling more relaxed and less anxious. Diffusers can also be used to eliminate sinus and allergy problem, which is something that a humidifier cannot do. This diffuser is recommended because it runs several hours and features LED lights that add to its operational appeal. The woodgrain appearance adds to any home’s décor whether it is modern or more traditional. When you use a humidifier to moisturize dry air, you can also breathe more easily but for another reason. Not only will a humidifier relieve dry skin but it will reduce the symptoms caused by colds. That is because a humidifier can reduce the irritation suffered in the nose and throat. While this type of device does not offer antifungal properties, it does prevent viruses by emitting moisture. Humidifiers can be used to reduce the incidence of colds and the flu virus. You can also use a humidifier to reduce the incidence of snoring. Because a humidifier keeps the throat moisturized, people snore less when a humidifier is used. One of the popular humidifiers offered on the market today is the MistAire XL Cool Mist Humidifier. This one-gallon device is a cool mist humidifier that is made for moisturizing large areas. A number of features support the device, including a one-gallon tank, automatic shut-off, nightlight options, and variable mist control. If you want to moisturize your living space, this is the humidifier to select. What Do You Want From a Humidifier or Diffuser? If you want to feel less stress, you will find that a humidifier or diffuser can assist you in this respect. Because a humidifier relieves the dryness in a room, people feel more comfortable and less anxious. A diffuser lessens stress as well because you can add an essential oil such as lavender and feel calmer immediately. The pleasant scents make it possible for you to unwind happily after a hard day at work. What Are Essential Oils and How Do They Work with Diffusers? Essential oils come from various plants. They are derived from elements such as the flowers, roots, or leaves and are distilled into a liquid, which is converted into a steam by the diffuser. Many users of essential oils believe that the oils stimulate their senses and improve their general health. Besides inhaling the oils from a diffuser, users can also add the oils to baths or use them for massage. An Evaporative Diffuser: When you use an evaporative diffuser, the oil drops are added to a filter or pad and a fan blows the air through the filter or pad. The oils will evaporate more quickly when this type of device is used. Therefore, an evaporative diffuser is a fan-based device. A Heat Diffuser: A heat diffuser features a heating element that causes the oil to disperse quickly into the air. The oils diffuse rapidly into the room. This type of diffuser is recommended for a small space such as inside a car. A Nebulizer Diffuser: A nebulizer diffuser works similarly to a perfume atomizer. In this case, the oil is added to the bottom of the diffuser through a tube. Air blows over the oil’s surface at the top of the tube. Tiny droplets of oil diffuse throughout the living space. An Ultrasonic Diffuser: An ultrasonic diffuser allows oils to be added to the water in the diffuser. The oil remains on top of the water. A disk or plate vibrates and agitates the water so the oil will break into particles. A mist humidifies and adds a pleasant perfume to the air. An Evaporative or Cool Mist Humidifier: This humidifier operates when you add water to the reservoir. A wick soaks up the water and a fan blows air through it. Moisture is dispensed throughout the room. An Impeller Humidifier: This cool mist humidifier uses a spinning disk to diffuse water. The diffuser in the device breaks the water into droplets. The droplets float into the air and moisturize it. An Ultrasonic Humidifier: This humidifier comes in both warm mist and cool mist versions. The device uses a vibrating metal diaphragm that produces vibrations of sounds. The vibrations propel small water molecules into the atmosphere. The air instantly absorbs the water. When you are choosing a humidifier or diffuser, you need to think about how the device will be used. If your main goal is to add moisture to the air, you should concentrate on choosing a humidifier that is easy to operate and will cover a large area. Many people like ultrasonic humidifiers as they are easier to use and operate. They also are more technologically advanced and dispense moisture more satisfactorily. If you are seeking a diffuser, you want a device that will pleasantly scent the air. Do not count on this device to moisturize the air to your satisfaction. The water is used to dispense the essential oil in a vaporized form in the air. Use this device to decontaminate the air and make you feel more relaxed. If you are seeking a combination diffuser and humidifier, you will find that this type of product will still not produce the same results as when the devices are used separately. If you want to scent your room but also keep it moist, it is better to buy a diffuser separately from a humidifier. Do not confuse these products’ operation because they both need water to function. They are distinctly different. When you understand that humidifiers add moisture to the air and diffusers perfume the air with natural essential oils, you will understand how they differ in operation.